Water is considered a public good in Israel. The basis for policies and water administration in Israel is the 1959 Water Law. According to this law, all water belongs to the state. This includes wastewater, sewerage and runoff that could be used commercially as well as water on a landowner’s property. However, the government works with the private sector to finance desalination projects by appointing private companies to construct and operate the desalination plants according to Build-Operate-Transfer (BOT) schemes (Fig. 8). The Water Authority Council forum is responsible for the timely authorization of all decision-making and policy-setting made by the Israeli Water Authority and associated ministries. The council is made up of eight representatives: five from the ministries of Infrastructures, Environmental Protection, Finance, Interior, Health, one from the Water Authority, as well as two public interest group representatives. Mekorot is the government-owned company in charge of the NWC. The company was founded in 1937 and began operation of the NWC in 1950 under the supervision of the Ministry of Energy and Water Resources. Mekorot provides approximately 80% of Israel’s drinking water and meets 70% of the total annual water demand in Israel. Additionally, Mekorot owns 34 desalination plants, which provide approximately 40 MCM/yr of treated brackish water. Mekorot also treats approximately 35% of Israel’s wastewater. 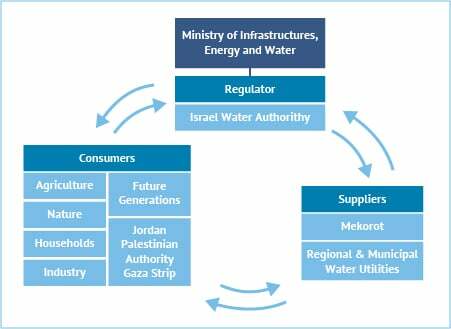 Private companies contribute to Israel’s water supply in two ways: by producing and supplying water in the areas that Mekorot does not cover, and by constructing and operating desalination plants. There is no private ownership of water resources in Israel. Since 1998, 11 desalination plants have been built or are under construction as part of public-private partnerships (PPP). Additionally, there are seven projects currently in various stages of development. The total investment in desalination from the private sector is $1.9 billion and the total investment value of these projects is estimated at $5 billion. This includes transportation, construction and water treatment. As previously mentioned, desalination plants in Israel are financed by private companies. The construction and operation of the plants under PPP contracts are financed by the private company that owns the plant. The government buys water from the plant and makes bimonthly payments that include fixed and variable payments depending on the plant’s performance. The fixed price is an unconditional payment to the desalination company based on the output of the plant that is agreed in the contract. This ensures a return on capital investment regardless of actual water consumed. The variable price is the payment for each cubic metre of desalinated water delivered to the state. This allows for the variable costs of production (energy, chemicals etc.). The remaining cost of water supply is paid for via tariffs. Figure 9 summarizes water tariffs for consumers in different sectors. * Low-quality water refers to treated wastewater and inferior quality water. ** The price is gradually reduced based on salinity of the water. Higher salt concentration reduces cost. WWTP = wastewater treatment plant. Israel Water Authority, 2012. Long-Term Master Plan for the National Water Sector Part A – Policy Document Version 4. Mekorot, 2015. Main Facts & Figures. Mekorot, 2015. Wastewater Treatment and Effluent Reuse. Israel Water Authority, Collaboration between Private and Public Sector for Financing Desalination in Israel. No date. Fernandes, G., 2012. Economics Aspects in Water Management in Israel Policy & Prices.